Aserca Airlines on May 22, 2018, ceased all operations. The company has returned its AOC and will no longer operate. Venezuelan carriers are struggling with the economic conditions in the country. Copyright Photo: Aserca Airlines McDonnell Douglas DC-9-82 (MD-82) YV153T (msn 49486) CUR (Ton Jochems). Image: 940969. 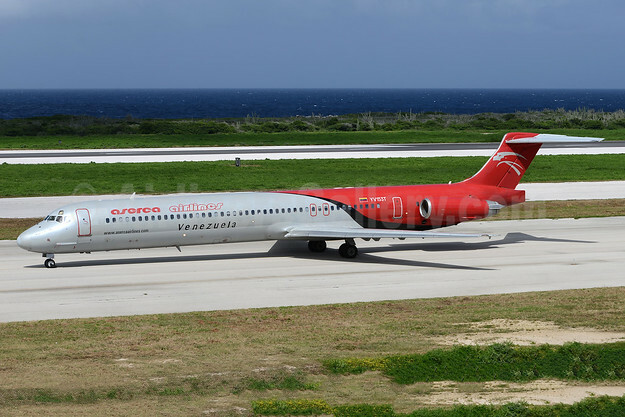 This entry was posted in Aserca Airlines and tagged Aserca Airlines, McDonnell Douglas DC-9-82 (MD-82), msn 49486, YV153T on May 24, 2018 by Bruce Drum. Aserca Airlines has announced on social media it suspended operations on February 15 due to “technical reasons”. The airline is intending to resume operations on February 23. This entry was posted in Aserca Airlines and tagged Aserca Airlines, McDonnell Douglas DC-9-82 (MD-82), msn 49486, YV153T on February 18, 2018 by Bruce Drum.